With daisy like flowers Helenium come in a range of colours and are a very useful clump forming perennial. Helenium plants species such as Helenium autumnale, are sometimes known as ‘Sneezeweed’. It is the cultivars that are most sought after, with H x autumnale ‘Moerheim Beauty’ being one of the best known. Brilliant mid to deep red flowers with a touch of black. The cultivar ‘Dark Beauty’ is similar, just a shade or two darker. Another old cultivar is ‘Riverton Gem’ orange to yellow flowers and a very reliable performer. The yellow flowering Heleniun ‘Solar Flare’ has golden yellow petals with a deep, almost black centre. Many other cultivars are offered, generally in red or yellow tones. 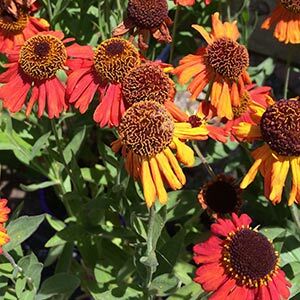 Helenium are a hardy perennial flowering in late summer and autumn, prefer a well drained soil. Grows to 1m and with yellow through orange to red flowers can make an interesting cut flower. Cut right back in winter fertilize during main growth period. Helenium are frost tolerant, heat tolerant and even wind tolerant. Plant in early winter in a humus rich soil. Best suited in a soil that will maintain some moisture through summer. Water in new plants with a liquid seaweed fertiliser. Try to find a position protected form strong winds to help lower evaporation as well as protect the flowers. These are a late flowering plant, producing best flowers from summer through to autumn. Plants can be pruned back in late winter to early spring. This tidies up the plants and promotes a bushy growth habit. This is also a good time to fertilise using a general purpose slow release type, or your favourite seaweed fertiliser.